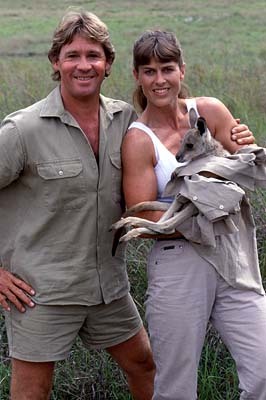 you and steve were the perfect couple, the whole world lost a great man that day but he live in our hearts always. i pray for your family always. True soulmates...it's something that is not often experienced by many in this lifetime but Terri and Steve were what milions crave...true love, devotion and a willingness to do anything for the one that you love. we will always admire your work we reackon you and Terri were soul matez !!!! Terri misses Steve! I miss Steve. I believe that when you go to Heaven, you get to come visit the ones you left behind. Steve will always be with Terri in spirit, helping her stay strong until it's time for her to join him in Heaven. all my toughts are be with you. steve still lives in his dauther bindi. Now..here's the real example of two people...who are Soulmates. Terri, Our thought and Love goes to you and your children. Terry was very lucky to have had someone like Steve. But Steve was also very lucky to have had someone like Terry. i will miss you a lot. i am 7. we watch you every day. god bless you.